Intracytoplasmic Sperm Injection (ICSI). During an IVF cycle it may be necessary to perform other assisted reproductive	technologies to facilitate implantation. Intracytoplasmic Sperm Injection	(ICSI) procedure is performed in cases of severe male factor infertility. The embryologist microscopically identifies a normal appearing, active	sperm and will directly inject this single sperm into an egg that has	been retrieved. This technique is used when the man has a very low sperm	count; a low number of normal-shaped sperm; or when sperm is retrieved	from the epididymis or testis. Assisted Hatching (AH) is a microscopic procedure performed by the embryologist. The outer “shell”	of the embryo is made of a thick protein and is called the zona pellucida. In order for implantation to take place, the zona pellucida begins to	“hatch” or break down so that the embryo can furrow itself into	the lining of the uterus and establish a physical connection with the	mother. Assisted hatching facilitates this process. The embryologist microscopically	“thins” the outer protein shell in order to assist the embryo’s	hatching and implantation process. The decision to perform Assisted Hatching	is based on the thickness of the zona pellucida, the number of cells present	in the embryo, the degree of fragmentation within the embryo and the age	of the woman. Pre-Implantation Genetic Diagnosis (PGD) is a set of procedures that are performed on embryos prior to implantation,	sometimes even on oocytes prior to fertilization. PGD is considered another	way to prenatal diagnosis. Its main advantage is that it avoids selective	pregnancy termination as the method makes it highly likely that the baby	will be free of the disease under consideration. PGD thus is an adjunct	to assisted reproductive technology, and requires in vitro fertilization	(IVF) to obtain oocytes or embryos for evaluation. Frozen Embryos. The nature of in vitro fertilization creates a situation where several	embryos are created. To transfer all of these embryos may be unhealthy	and very risky for complications in both the mother and babies. To avoid	this high risk pregnancy, only one to three embryos are transferred to	the woman’s uterus. This leaves viable embryos in the laboratory. These embryos undergo a specialized “freezing” process and these	frozen embryos are then stored in the laboratory. The frozen embryos remain	in storage until the couple is ready to undergo another embryo transfer. During a frozen embryo transfer cycle, the woman’s uterus is hormonally	prepared for implantation. Once the lining of the uterus has developed	adequately, the embryos are thawed and then transferred to the woman’s	uterus. The woman continues to take these hormones until the placenta	takes over the hormone production that is necessary for maintaining the	pregnancy. The pregnancy continues to develop just like any other pregnancy. Sperm Retrieval (TESA and PESA). A man may have physiological or anatomical condition that prevents the	passage of sperm. The condition may include a congenital absence of the	vas deferens; a prior infection that has caused a blockage; decreased	testicular functioning that causes a low sperm count. This man’s sperm	may be retrieved from his epidydimis, vas deferens or testicular tissue. When the sperm are retrieved from the epididymis the procedure is called	Percutanous Epididymal Sperm Aspiration (PESA). If the sperm are retrieved	from the testicle it is called Testicular Sperm Extraction (TESE). Using	the sperm that the urologist has retrieved is then passed to the embryologist	and an ICSI procedure is performed. 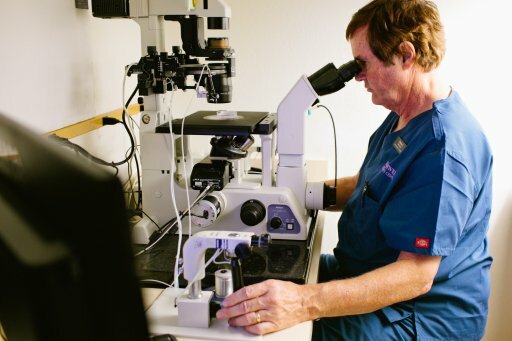 Call 602-956-7481 to speak with a Fertility Specialist today about all available assisted reproductive technologies fertility treatment options. I had my first appointment at Southwest Fertility on the 23rd of May and I was nervous, anxious and scared all at the same time and I have to be honest when I left I felt at ease and confident that my partner and I’s dream of becoming parents was finally within grasp. The staff was so caring and attentive making the experience that much more enjoyable. There’s a lot of info that is given on the first visit which would have been overwhelming if Dr. G and her staff hadn’t been so diligent in ensuring our understanding of it all. You really get a sense that they are passionate about their jobs and patients. Janet sat and chatted with us for a while and made us laugh which was a nice change from other experiences I have has in doctors offices. I felt that they went above and beyond my expectations which is not an easy feat by any means. My partner and I have been together for almost 8 years and for about half of our relationship we have wanted kids and for some reason or another we felt like that day may never come but now we are confident that our time will come thanks to Southwest Fertility. I can wait for this exciting chapter in our lives and thank you Southwest Fertility for getting us there. I had my first appointment at Southwest Fertility on the 23rd of May and I was nervous, anxious and scared all at the same time and I have to be honest when I left I felt at ease and confident that my partner and I’s dream of becoming parents was finally within grasp. The staff was so caring and attentive making the experience that much more enjoyable. There’s a lot of info that is given on the first visit which would have been overwhelming if Dr. G and her staff hadn’t been so diligent in ensuring our understanding of it all. You really get a sense that they are passionate about their jobs and patients. Janet sat and chatted with us for a while and made us laugh which was a nice change from other experiences I have has in doctors offices. I felt that they went above and beyond my expectations which is not an easy feat by any means. My partner and I have been together for almost 8 years and for about half of our relationship we have wanted kids and for some reason or another we felt like that day may never come but now we are confident that our time will come thanks to Southwest Fertility. I can wait for this exciting chapter in our lives and thank you Southwest Fertility for getting us there.